Subject – Provision of telephone facilities and reimbursements to officers of Government of India. The Department of Expenditure has from time to time issued instructions on provision of telephone facilities. monetary ceilings on reimbursement to the officers of the Government of India, Given the increasing dependence on telecommunication technology including mobile telephones for carrying out official work. the existing instructions have been comprehensively reviewed, revised and the following instructions are hereby circulated for compliance by all Ministry/Departments. In supersession of all earlier instructions issued by this Department on the subject. 1.2 ISD facility is allowed on official telephones in respect of Administrative Secretaries only. 1.3 All other cases for providing ISD facility on official telephone for officers to the level below Secretary to the Government of India may be decided by the Administrative Secretary in consultation with the concerned Financial Adviser. 1.4 Administrative Secretary/ Head of Departments may in consultation with the concerned Financial Adviser provide officers below the level Of Deputy Secretary official telephones with STD facility on functional basis. This facility should not be given in a routine manner, but extreme caution and austerity should be exercised. 1.5 Financial Advisors shall submit a half-yearly report to D/O Expenditure on the number Of ISD facility concurred/approved during a financial year. 2.1 All officers of the level of Deputy Secretary equivalent and above are entitled for one official residential landline telephone with STD facility. 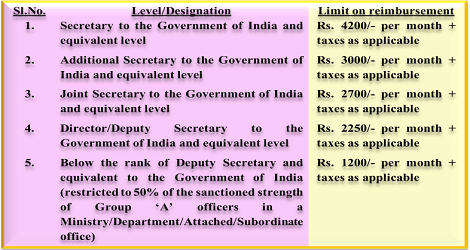 2.2 Residential telephone can be allowed to Officials below the rank Of Deputy Secretary equivalent on functional basis subject to the condition that this facility shall be restricted to 25% of the sanctioned strength of Group ‘A’ officers in a Ministry/Department, This limit will equally apply to Attached and Subordinate offices. 2.3 ISD facility shall not be allowed on residential telephones. 2.4 Personal staff of Ministers [Private Secretary, Additional Private Secretary and 1ST PA of Ministry] and Administrative Secretary [Principal Staff Officer (PSO)/ Senior Principal Private Secretary/ Principal Private Secretary/Private Secretary], Section Officer (Parliament) and Assistant Section Officer (Parliament) are entitled to the facility of one residential landline telephone. 3.1 Officers Of the level Of Secretary and equivalent will be entitled to reimbursement for one mobile handset costing not more than (Rupees Twenty Five thousand only) once during the whole tenure, Global roaming facility shall not be allowed on the mobile connection. 4.2 NO SIM/data-card will be provided by office. 4.4 The amount shall be reimbursed on submission of bills/receipt by the concerned officer. Officers are at liberty to choose the service provider and the tariff package for residential landline/mobile phones. 4.5 In case where husband and wife are sharing the same residential landline telephone, and both are entitled for reimbursement. only one of them will be allowed reimbursement against the residential landline telephone. The claim for mobile phone charges shall be treated separately for each of the officer subject to the entitled ceiling. 4.6 Reimbursement for mobile will be restricted to the officer in whose name the mobile connection is registered. 4.7 The entitlement of an officer drawing pay in a scale intervening between that of Director and Joint Secretary would be at par with that Of Deputy Secretary/Director. 4.8 Excess expenditure up to 30% of the ceiling amount (applicable to the officer) can be reimbursed to officers of Joint Secretary equivalent and above and also to Private Secretary/ Officers on Special Duty to the Ministers subject to their submitting a certificate, duly justifying that excess expenditure incurred was for official purpose and unavoidable. This reimbursement would require the concurrence Of the Financial Adviser concerned and sanction of the Administrative Secretary/ Secretary Equivalent of the Department/ Organization. In so far as Secretary/ Secretary equivalent officer are concerned, they shall be competent to exercise the aforesaid powers in their own cases. The power to sanction this expenditure shall not be delegated. 4.9 Telephone reimbursement will not be admissible in cases Of Leave (Of any nature) and trainings which are for more than one calendar month (s). 6. These orders shall be effective from the date of issue of this Office Memorandum.